MVS-California, LLC, winner of the USA Challenge, took the top global prize in this year’s European Satellite Navigation Competition (ESNC) with the company’s True3D Head Up Display & Navigation System. 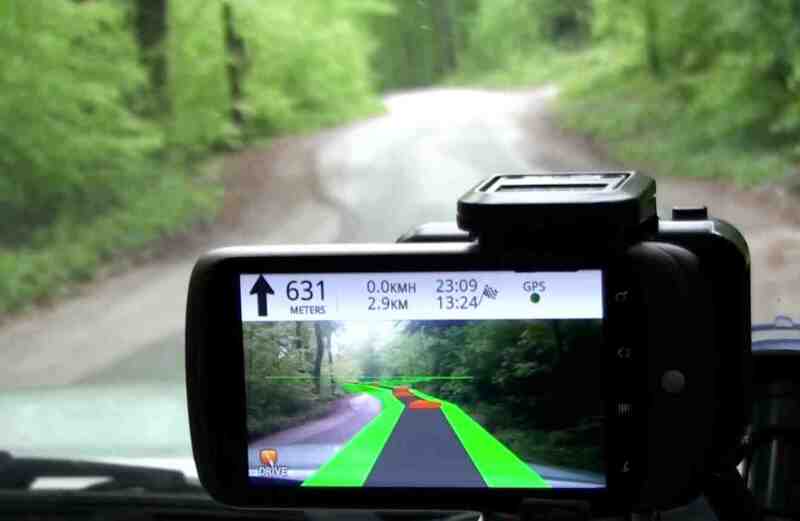 The company’s innovation is an augmented reality navigational display engine designed to provide non-distracting, translucent location guidance to untrained operators of any type of vehicle. Announced at award ceremonies in Munich, Germany, last night (October 19, 2011), the honors for the San Francisco Bay area–based early-stage automotive safety and display company also included the NAVTEQ Special Topic Prize for Mobile Enterprise Solutions. As the ESNC grand prize winner, Making Virtual Solid (MVS) will receive €20,000 ($27,000) in cash awarded by the Anwendungszentrum GmbH Oberpfaffenhofen (AZO, the Space Applications Center that organizes the ESNC) and the European GNSS Agency (GSA). In order to be considered in the ESNC finals, MVS had won the USA Challenge, a regional ESNC partnership organized by Inside GNSS magazine and cosponsored by NovAtel, Inc., and the Institute of Navigation. Inside GNSS is also the global media sponsor for ESNC 2011. The company was one of five finalists introduced at the ION GNSS 2011 conference. MVS and its True3D HUD innovation will be featured in the November/December issue of the magazine. Cost-engineered for the automotive market, the True3 HUD accurately places images — icons, road signs, a guide wire — in the driver’s forward view. These images appear to be outside the windshield, from a distance of two meters to infinity, thus rendering conformal display. The Virtual Cable and Virtual Signs images, generated by linking GNSS, map, and POI data, have been designed to maximize situational awareness using NASA guidelines established for pilot safety. The images are volumetric (truly 3D) and capable of refreshing at a rate of 60 frames per second, enabling real-time data streaming. MVS-California has advanced reference designs and detailed manufacturing plans and is seeking to collaborate with ecosystem partners who can assist them in commercializing the HUD’s potential in automotive, trucking, marine, and avionics markets. The MVS-California team is led by Chris Grabowski, MVS CEO and chief science officer; Juliana Clegg, COO; and Tom Zamojdo, CTO. A YouTube video of the True3D HUD system in operation during a field test can be viewed here. Judges for this year’s USA Challenge were Neil Gerein, NovAtel; Hans Kunze, KLA Global; Dr. John Raquet, Air Force Institute of Technology; Doug Taggart, Overlook Systems Technology; Dr. Todd Walter, Stanford University; and Glen Gibbons, editor of Inside GNSS. 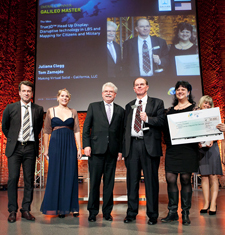 The ESNC grand prize winner — designated as the Galileo Master — is selected by an international panel of judges with representatives from the regional competitions. • The opportunity to present the final application to NAVTEQ partners and customers, including leading handset manufacturers, platform and technology providers. Second place in the overall ESNC results was shared by Baden-Württemberg’s regional winner, Jens Rieder and his team from the Universität Heidenheim, for SkyAmps — a highly efficient, fully automatic wind power plant based on two kites; and the regional winner for Switzerland, Philipp Elbert and his team from the ETHzZürich and the Swiss company HESS AG, for AHEAD — a system designed to minimize the CO2 emissions of hybrid electric buses through a predictive energy management strategy based on precise positioning. Third prize in the competition was also shared by two regional winners: Hesse, Germany’s Dr. Jörg Pfister, of pwp-systems GbmH, with PTbox, a robust positioning unit for public transport designed to offer enhanced attractiveness and reduced CO2 emissions; and Vladimír Vejvoda of Prague, Czech Republic, for Mobile Epileptic Fit Detector (MEFID), a mobile remote unit that can help save lives by rapidly detecting signs of an imminent epileptic attack in child patients. ESNC 2011 set another participation record with an all-time high of 401 participants from 49 countries submitted their ideas for GNSS innovations in more than 40 different application areas. Complete result of the regional and special prize competitions can be found here< http://www.galileo-masters.eu/index.php?kat=press.html&anzeige=press47.html>.